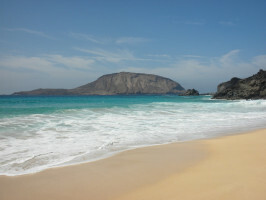 Spend an idyllic day on the incredibly beautiful island of La Graciosa. 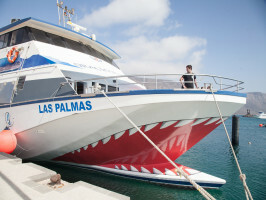 Travel by modern ferry to this volcanic island, just 30 minutes to the north of Lanzarote and step into another world. 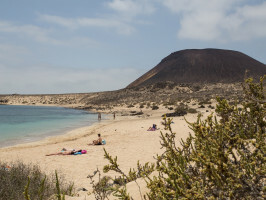 La Graciosa is part of the Chinijo Archipelago and is a real haven for nature lovers with its dramatic volcanic landscapes, secluded beaches with incredibly clear turquoise waters and sleepy laid back charm. 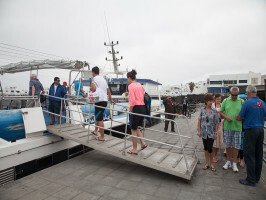 The fun starts as we board the modern Romero Lines ferry at Orzola on Lanzarote. 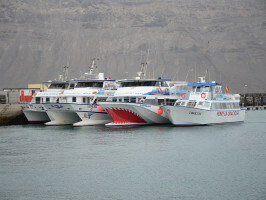 The crossing to the island's main settlement, Caleta de Sebo takes just 30 minutes. In the distance you'll be able to see the neighbouring islands of Montaña Clara, Alegranza, Roque del Este, Roque del Oeste and several other islets. There are no roads here and very few cars and the landscape is stark and strangely beautiful. There's plenty to do here whether you feel like lazing on one of the island's many beaches, snorkelling in the incredibly clear turquoise waters or hiring a bike and exploring the island's dramatic volcanic landscapes. Some of the best beaches are to be found at Las Conchas and La Francesa and the yellow Montaña Amarilla and the red crater-peaked Monte Bermeja are also well worth a visit. 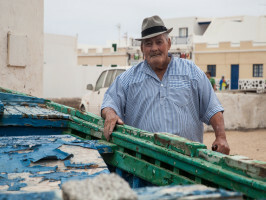 Then take some time to enjoy the quiet pace of La Caleta with its unpaved sand streets and excellent seafood restaurants before catching the ferry back to Orzola. (*) Summer only: from july to october. Please exchange your voucher at: Calle La Quemadita S/N Muelle de Órzola, 35.541. Lineas Maritimas Romero. *Summer only: from July to October.